When I reflect on the progress made in our fight against cervical cancer, we have made great strides in high-resource settings of the world. HPV DNA testing has helped to determine whether a woman needs further medical attention following a borderline or ambiguous Pap test result. There are approved vaccines which are highly effective in preventing persistent infections with the high risk HPV types that cause the majority of cervical cancers. Furthermore, treatment of cervical cancer with radical surgery, radiotherapy and chemotherapy has improved considerably. It is unfortunate this is not the case for other parts of the world with fewer resources. According to the World Health Organization (WHO), cervical cancer is the fourth most frequent cancer in women with an estimated 570,000 new cases in 2018 representing 6.6% of all female cancers globally. Approximately 85% of deaths from cervical cancer occurred in low- and middle-income countries (LMICs). Women with locally advanced or metastatic cervical cancer occur because of a lack of preventative measures, such as vaccination against HPV, lack of access to screening as well as failure to detect and treat lesions at the pre-invasive stage. At the IGCS, we have a responsibility to help reduce mortality from cervical cancer worldwide and to help raise awareness about the importance of both HPV vaccination and cervical cancer screening. I am pleased to announce that IGCS is working with the WHO to collaborate in response to a call to action made by the Director-General, Dr. Tedros, in May 2018 for the Elimination of Cervical Cancer. To be effective, this elimination initiative must be conducted in a way that all core challenges are specifically and comprehensively approached. For 2018-2019, seven Working Groups have been formed under the WHO-led Secretariat to accelerate work on the various elements of this initiative. Kathleen Schmeler, Chair of the IGCS Mentorship and Training Committee recently attended the WHO Working Group meeting for Monitoring and Surveillance related to screening. 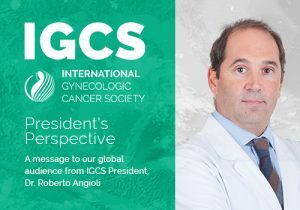 Raimundo Correa and I from Chile will be attending in early February representing the IGCS on the Palliative Care and the Invasive Cervical Cancer Working Groups. We hope in the near future to engage our strategic partners in pathology and colposcopy in this WHO initiative. We have written a statement committing our support of the WHO Initiative for the Elimination of Cervical Cancer, which has also been endorsed by IGCS’s Strategic Alliance Partner organizations. We will continue to update you as we make progress in this important work and ask for your help. There is much work to be done but I am confident with our increased global footprint and our strategic partnerships we have established over that last two years, we are positioned to be instrumental in making a difference in the prevention and treatment of cervical cancer, particularly in low resource settings. Like and Follow IGCS on Social Media to keep up with the latest from the society and industry.